It was a day after i cleared the dust from Hawking’s “A Brief History of Time”, to sink into an experience of feeling how miniscular and insignificant we are in this mysterious conspiracy which we have conveniently named “The Universe”. Perhaps the day after that, was when Mama Nature had scheduled her practical exercise to prove me the same point with a milder version of her boundless power. After seeing through the exercise, I am tempted to write my observations which i hope, describe Her session with me! Six months back i had enthusiastically laid my hands on an original edition of the Stephen Hawking best seller, with my biting conscience resisting the temptating calls of the pirate seller who was giving it away at one fourth the price without bargain in the streets of Fort, Mumbai. Each progressing word of the book gave me an out-of-body experience and took me farther and farther away from the surface of the earth. I was feeling myself shrink smaller with the book gently unfolding the limitless expanse of the Universe with its innumerable unanswered riddles. Back to the world that we know as real (which by then was an imaginary projection), the skies were getting darker, challenging the reducing lumens of the sunlight that passed through the mounting clouds. Despite being near-twilight at 12 noon, The clouds were as stingy as much as they were dark, since they did not even spare a single drop of rain! Meanwhile news started pouring that the far off suburbs and places like Thane and Panvel is where the action was happening with the fear of floods in few places. I woke up with enthusiasm, which i used to don during my days as a sales person, smiling brightly at the mirror. I had a client meeting, which is very rare in my present case where in most of the things happen over phone and email. I dressed carefully in a bright white arrow shirt with a brown Allen Solly trouser. The only dark spot in the shirt was the flauntable arrow logo on the right cuff. I was tempted to wear a neck-tie but the folks at my office would think its my birthday and demand a treat. I reached office guarding my white shirt with a windcheater which bore my company logo. At two thirty, i took my eyes off my computer to look out towards the window. It felt as though some divine hands had dimmed the lamps outside, casting an uncanny gray ambience over the central garden green. It was darker than usual, felt as though it was past 7 PM, but my watch argued otherwise. The rain started its onslaught by 2.30 and from the confines of the office, it felt as though it was yet another ordinary heavy rain of Mumbai which could be easily scaled with the courtesy of my windsheater and umbrella together. At 3 PM, Boss and I left office in a cab, thinking that train may be a problem. At Dadar, the storm cloud bursted its with-held bladders on our helpless cab which was flapping its windshield wiper in desperation. The inside of the glass was fogged with the driver trusting his gut-feel of the mean streets, and by the faint glow of the tail lamps that filtered through the frosted windshield. Every ten minutes we asked the driver where we had reached… Prabhadevi.. Dadar…Shivaji park…Mahim..Every reply saw us getting disappointed over the fact that we would be late for the meeting. Little did we know that our appointment was fixed for another terribly demanding client… The weather. We tried to reach the client, but darn!! his phone was sounding busy. We finally got stuck up at the Mahim causeway signal. I dared to ask the cabbie how far the highway was and he bleeped “Ek aadha kilometer sahab”. Its then i realized that the water from the sea face was appearing to cross the Hutments of the fisherfolk and creeping into the busy streets. The wayside palms bent beyond their usual 90 degrees, as though they were bowing down to a noble woman approaching dressed in a strange grey garb. The scene was highlighted with a heavy confetti of wind-dispersed raindrops. The water levels on the road rose higher and finally i could feel the waves hitting the bottom sheet of the cab, under my feet. A couple of apathetic heavy vehicles created a strong wavepool in which i could feel my cab almost drifting. As a citizen of a democratic nation, the cabbie utilized his fundamental right to abuse the government for forcing his cab to run on CNG engine which is the first to succumb to the rains. His predictions were true and the car finally stalled at the causeway. He begged us to pay a flat higher rate to compensate his day and asked us to jump the divider. I told boss that we had no other option but to get drenched. Luckily i had many plastic bags in which i could safely confine my most precious digital camera, which i was hoping to carry to my friends house to capture a function, and my ardhaangini.. my phone. 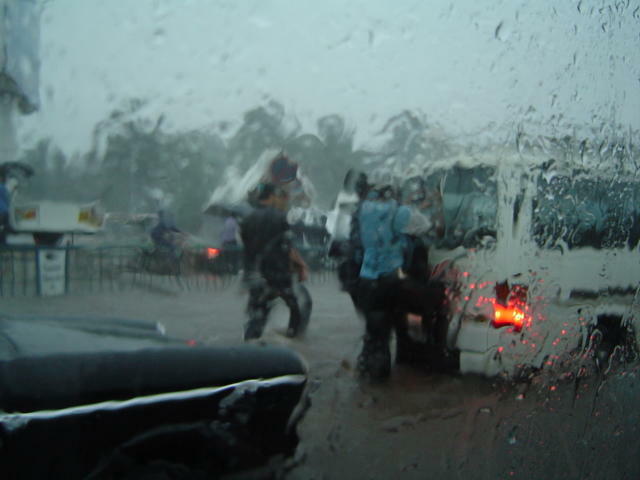 Moment of truth:The moment i stepped out of the cab, we got drenched to the bone in five seconds flat, as though my arrow shirt topped with the windcheater and the trousers, were no clothes at all. The raindrops felt like bullets, not that i had braved any of them to know the experience, but it hurt hard on the face. We somehow jumped over the divider and saved ourselves from knee deep water to land in ankle depth. We quickly decided that the highway route would be the best since the interior roads would have been flooded with open manholes at large. As we dashed out towards the highway, we were racing against a crowd moving in the opposite direction. A papaya tree gave up its vows to the ground it stood and crashed just a couple of steps ahead of us. After pushing hard against the wind and the cheek-piercing rain-shrapnels. We took a five second refuge under the shade of the foot-over bridge whose roof could not stop the horizontal raindrops. We decided to walk to the highway towards Bandra and all the way till Sion to catch a train from there. We thought the rain was seeming heavy there because of the seasiude and were still hopeful that the trains were running on the central side. The flyover crossing the highway served as a partial shelter to stranded people, mainly two wheel riders, who were already tormented by wearing soaked helmets to save themselves from the sadist cops. We did not stay under the bridge for too long. Despite our age difference, my boss and I felt like two school boys enjoying getting themselves drenched after bunking their classrooms. But by the time we reached the next signal we could be certified as aquatic. Near the kala-nagar signal we caught hold of a Rickshaw and asked him to take us to Sion, He agreen reluctantly but after seeing an ocean at bandra kurla complex he took a U-turn. We saw many people taking the flooded side footpath of the road which also had open manholes, We saw a lady tripping but thankfully she was safe. WE took the center of the road and carefully followed the vehicles ahead of us. We passed through Dharavi towards Sion. My boss was not willing to believe that we were passing through Asia’s largest slum since the Road side was looking like a full fledged leather mall, save that it was all part submerged, with the tanned hides of jackets, purses, shoes and belts lapping up the storm water. At a distance i pointed to the Sion station which appeared hazy behind the showers. When we reached the station, boss was looking at the indicator, just when i pointed the platform to him and we both started laughing like madmen. The water level over the tracks had come up to the level of the platform and was flowing towards kurla at a pace much faster than the stalled trains. Just when we were walking towards the next signal, a car brushed by us and its owner offered us a lift till chembur which was quite close to my home and meant few Km’s nearer to boss as well. THrough the traffic our car went slowly. the car was luxurious with the FM radio stations busy playing item numbers and old movie songs in a contrasting combo, but nothing about the real world! Perhaps the radio compere had kept the auto playlist in control and fled home, I thought. Some of the driest places, everard nagar, priyadarshini were all submerged and looking they were resting on a shiny red muddy surface. with few abandoned cars floating towards the side gutters. We somehow reached the Kurla signal flyover where we parted with our host. Vehicles were not moving beyond since there was a sudden increase in water levels here and what we saw was the Red Sea!! We walked slowly through the flood. My Arrow shirt was going through a natural wash cycle of the raindrops while my allen solly trousers and bata leathers were beating the flood waters. Despite forcing my boss to come to my house, he decided to put his efforts or call me later. We parted at the next signal. 7 PM, The fading sunshine made me realize how chaotic it was without electricity anywhere, with a vehicle breathing its last gasp every 50 meters. As i crossed the Amar Mahal Signal I saw many vehicles getting “amar” before reaching their “mahals”. Shoppers stop.. sumaria.. Gautier and the small grocer’s shop, the rains were equally merciless to all. They did not even have the opportunity to move their stocks. Finally i was relieved to reach the entrance of the area where i stay, only to see a giant tree collapsed to make my home feel farther away. The next morning after the skies had relatively cleared i was horrified to see a dead man under that. I felt that he would have been there when i walked past on my way back, when perhaps he lay unconscious ..maybe gasping… but with his heart still beating.. coming to a grinding halt to its rhythmic ritual of 30 plus years in that person’s chest. The water got deeper as i finally entered my lane.. In the near-darkness, I was horrified to see my groundfloor neighbor’s abandoned homes filled with water till the waist. There was not a soul to be seen on the street or in the building balcony. Soon i did glimpse candle lights through the rain which was now forceful as the waterfalls i had bathed at the Malshej ghats. This was the first time that i was thankful that my home was on the third floor. I walked in pitch darkness with light from the screen of my mobile phone. Mom was glad to see me home, we were hosting our ground floor neighbour who had to abandon her car and come to our home with her son. I was glad that my sister decided to stay at her office who took all their employees later to a nice guest house in Malabar Hill. My niece was playful as usual, undettered by the absence of electricity and her mom’s electrifying voice (hehe sister bashing as usual). We were worried about Dad but he was home by midnight with an experience more tiresome than what i went through. But i thanked God that despite releasing his wrath on us he did take special care of my family and rendered us safe. This situation made me feel as though the roof of my house was removed and extended to cover whole of mumbai, which made me pray hard for everyone. But unfortunately some had to leave unexpectedly, with the rains as a sudden reason. Switched on the radio which was busy with its digital item number playlists with thin slices of situation of mumbai which made no sense. All India radio Mumbai was busy with experts debating on what happened in the union strike in Gurgaon. The PRO of Railways was optimistic to start the services in no time, however the “no time” is not yet due. The cribs can be endless… but it was a different experience to start the chapter on “space and time” in The book – A Brief history of time, in dim candlelight, with all the other modes of information and entertainment reduced to dead solids. The air was aloud with the sound of the raindrops accelerated by the wind, and was heavy with dampness. Soon got accustomed to it which finally put me to sleep, where the darkness of the room shook hands with the jet blacks of my sound slumber. hum fida ho gaye aapke blog per….